Word lets you add keyboard shortcuts to lots of different commands. But you can also set up shortcuts for your favorite styles, allowing you to whiz through a document and quickly apply them. Choose Tools -> Customize Keyboard. In the Categories list at the left, scroll down and select Styles. On the right, you’ll see a list of the styles currently available in your document. Choose the style you want, then highlight the Press New Keyboard Shortcut box and type in your shortcut keys (to avoid duplicating existing shortcuts, use combinations that include all three modifier keys—Command, Shift, and Option). Click on Assign to apply the shortcut. From now on, whenever you want to apply that style, simply highlight your text and press your new key combination for a quick and easy restyling. When you have a table that stretches over several pages—for instance, years of investment information or a giant contact database—it can becoming confusing to remember what each column stands for as you scroll through. But if you have headers on each page, you can easily see what the columns represent. To set up headers that appear on each page, create them like you normally do at the top of your table, using bold or colored characters, for example, to make them stand out. Select the entire header row by clicking to the left of it, then choose Table -> Heading Rows Repeat. Just like that, Word automatically adds that header to the top of each page. If you’ve ever copied and pasted text from Web sites and e-mails into Word, you’ve probably found that URLs are still underlined and hyperlinked, e-mail threads retain their various colors, and more. You then need to fix the text in Word to get rid of this special formatting. But by pasting text to match the current style, you don’t have to worry about reformatting it once you’ve added it to your document. The long way to do this is to copy some text, then choose Edit -> Paste Special, select Unformatted Text from the As box, and click on OK. Or you can save yourself even more work and do all that with a single keyboard shortcut. All you need is an AppleScript. When you save this script, name it Paste Plain Text\smV.scpt, and leave the File Format pop-up set to Script. (The smV in the name means that this script will activate when you press Shift-Command-V.) Store the file in /Users/username/Documents/MicrosoftUserData/Word Script Menu Items. The script should now appear in Word’s scripts menu. To use it, copy any text from any program. In Word, move the cursor to the spot you want to place it, and press Shift-Command-V. Your text will appear in the document’s default style—with no reformatting necessary. Word has a feature that automatically “fixes” certain things as you type, such as replacing teh with the. But you may not want it to make all of these changes. For example, if you type 1/2, Word automatically changes the text to a special character, creating a proper fraction. But you may prefer to keep your fractions as actual number characters. To undo this feature, choose Tools -> AutoCorrect, then click on the AutoFormat As You Type tab. 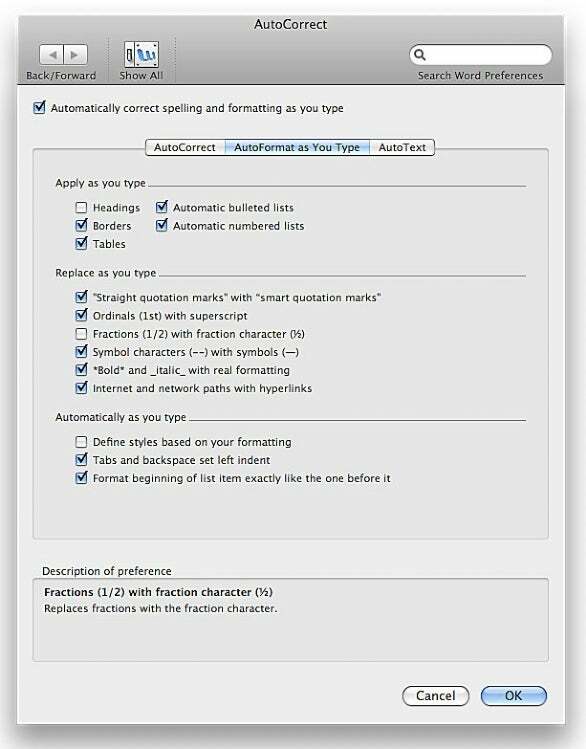 Under the Replace As You Type section, uncheck the option that changes fractions into special characters. While you have that window open, check out the other options (also look under the AutoCorrect tab). You may want to disarm other features that annoy you, such as replacing straight quotes with smart quotes, turning :-) into a real emoticon, or changing (c) into a copyright symbol. By scanning Word’s AutoCorrect settings, you can disable a number of the program’s annoying features. If you have a list that you want to turn into a table (such as a list of people you want to invite to a party), there’s no need to create a new table, then copy and paste the text into each cell. Just select all of the names (one per line), then choose Table -> Convert -> Convert Text To Table. You’ll immediately have a table with each name in its own row. To tack on columns for more information, hover your cursor over the top of the table, wait for it to turn into a downward-pointing arrow, then click to select the column. Go to Table -> Insert, and select either Columns To The Left or Columns To The Right. Suppose your list is more complex, with address and phone number recorded alongside each name. Make sure that each piece of information is separated by a tab, and that each person appears on a different line (with returns between lines). Select all text, and choose Table -> Convert -> Convert Text To Table. Just like that, Word will set up a table with as many rows and columns as it needs to accommodate your list.